Spend a few days of adventure and fun on the banks of the Kundalika River down in Kolad. Away from the hustle and bustle of the big city, you'll spend the night in comfortable cottages, surrounded by greenery and cool breeze. In the morning, you'll embark on a rafting adventure and pit your strength against the mighty Kundalika River. You'll go over gurgling rapids, rated grade II and III, for a 2-hr stretch over the river's twists and turns, making this a day to remember. This trip is ideal for travellers looking for a fun, adventurous and quick, overnight getaway from Mumbai and Pune. This package includes overnight stay in comfortable Safari cottage rooms that come equipped with a bed, pillow and blanket. The cottages have attached washrooms. 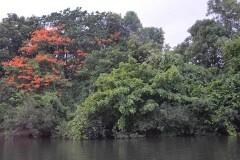 • Enjoy 2 hrs of Kundalika rafting for a 12-13 kms stretch. • Take a dip in the cool waters when your rafting activity is finished. • Spend a day in the riverside paradise of Kolad. • Stay in comfortable cottages at the campsite. Travellers are required to follow instructions of the rafting instructor while rafting in Kolad. Consumption of alcohol and drugs is strictly prohibited before the rafting activity in Kolad. 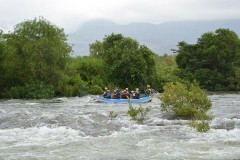 For cancellations made 7 days or more before departure date of this Kolad rafting trip: 100% refund. For cancellations made 4-7 days before departure date of this Kolad rafting trip: 75% refund. For cancellations made 2-3 days before departure date of this Kolad rafting trip: 25% refund. For cancellations made less than 2 days before departure date of this Kolad rafting trip: no refund. 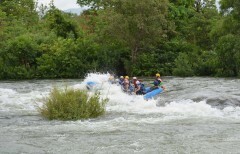 Rafting in Kolad is a water-dependent activity. The operator will not be responsible for last minute cancellation of the rafting trip due to inadequate or unsuitable water or weather conditions. Water levels of the Kundalika River are controlled by the Bhira dam. Due to this, rafting timings are fixed. Please make sure you're on time or you'll miss the rafting activity. The tour operator takes utmost care to ensure safety of the travellers and shall not be held responsible for any mishap or accident while rafting in Kolad. Day 1 of rafting in Kolad: Check-in and enjoy! Report to the campsite by 16:00 hrs, where you can keep your bags and freshen up. You can spend the rest of the day at leisure. After some evening tea, you can take a stroll to explore the campsite and rest in your rooms. When it grows dark, there's a campfire and a big dinner, after which you can retire for the night. Overnight in cottages at the Kolad campsite. Day 2 of rafting in Kolad: Check-out and go rafting! Early in the morning, you'll have breakfast and head out to the rafting start point. You'll board the rafts and set off on the Kundalika on your whitewater rafting trip. Over the 2-hr stretch, you'll paddle the raft forward, crashing with waves and tides, hurtling over the river's rapids. During the final stretch, you can jump into the river and spend some time splashing around. Return to the campsite, where you can change into dry clothes and have lunch at the common dining area. You'll check-out after lunch. Your trip ends here. Go rafting in Kolad down the Kundalika River! All equipment required for rafting: life jackets, helmets, paddles, inflatable rafts etc. Overnight in cottages at the Kolad campsite. You'll be accommodated in comfortable cottages that come equipped with beds, pillows and blankets. Today's meal package includes evening snacks and dinner only. The buffet dinner will have an option of one non-vegetarian dish. Today's meal package includes breakfast and lunch only. The buffet lunch will have an option of one non-vegetarian dish. The rafting start point in Kolad, accessible via road, is located 120-km/3-hr drive from Mumbai and 100-km/3-hr drive from Pune.